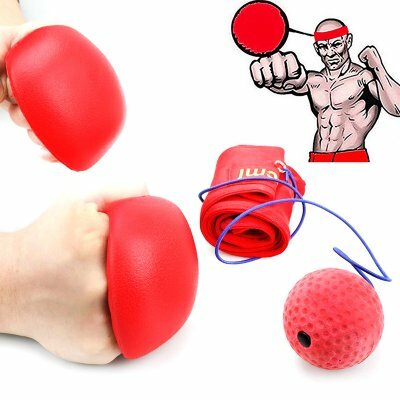 Successfully Added Decompression Boxing Ball - Polyurethane Foam Ball, Moisture-Wicking Headband, Easy To Carry, Speed Training, Faster Reflexes to your Shopping Cart. The MCML decompression boxing ball is a great way to train your mind and body. This boxing trainer ball helps improve hand and eye coordination as well as work on your agility and fitness. The 6cm diameter foam ball is attached to a moisture-wicking headband with a tough elastic strap. This allows you to achieve an intense workout as you hit and jab the ball moving from side to side to avoide it hitting you. Now you don't need to go to the boxing gym to train as this affordable boxing equipment is you're all in one training apparatus for improving hand speed, agility and accuracy. It is small comapct and easy to carry as well as being suitable for all ages. This decompression boxing ball comes with 12 months warranty, brought to you by the leader in cool gadgets and devices.. Adjust the elastic cord to make sure it is equal to the length of your arm.